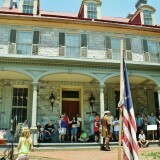 In celebration of the 250th Anniversary of the Harris-Cameron Mansion, the Historical Society of Dauphin County presents Founders’ Day, an outdoor festival commemorating the frontier era in which John Harris, Sr. and city founder John Harris, Jr. lived. The festival will take place at the John Harris-Simon Cameron Mansion, 219 South Front Street, Harrisburg, on Saturday, June 25, from 10:00 a.m. to 4:00 p.m. Admission to Founders’ Day is free and open to the public and will feature Revolutionary War encampments, food vendors, and children’s crafts and activities. A special feature at the festival will be an encampment with Revolutionary War re-enactors from the 1st Pennsylvania Regiment of the Continental Line and the Donegal Township Riflemen. The current 1st Pennsylvania Regiment, headquartered in Berks County, was organized in 1963 and is based on the famous unit of the same name that fought in every major campaign of the American Revolution. The mission of the Donegal group is to portray 18th century civilian and military life at historic sites, schools, and military reenactments open to the public. Native American re-enactors will also be participating in the festival.